Last week, Secretary of State Hillary Clinton said her final goodbyes to her employees of the State Department. As she left and gave her final waves before the cameras, she closed the door, on what was nothing short of an extraordinary 20 years in public service. As Secretary of State, Clinton achieved many things not the least of which is earning the distinction of one of the most well-traveled of our nation’s diplomats. She traveled 956,733 miles spent 2,084.21 hours traveling, and visited 112 countries. But besides the enviable acquired frequent flyer miles and countries seen, she was definitely a major player in an eventful four years in US foreign policy. During her tenure, Clinton was an advocate for the eventual US support of the liberation of Libya from Moammar Gadhafi. She also became the first secretary of state in 50 years to make an official visit to Myanmar, building our nation’s alliance with a newly burgeoning democracy. Many credit Clinton’s use of diplomatic resources and meetings in the Middle East that helped broker a continuing peace between Israel & Arab militants along the Gaza Strip when things became violent. 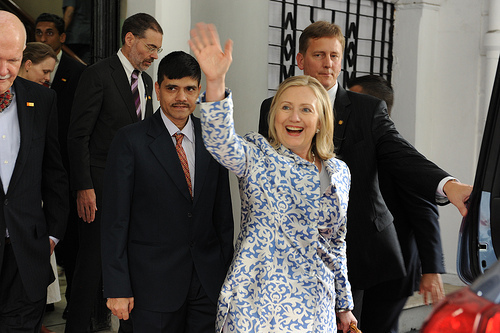 Clinton’s often criticized emotionless exterior was an advantage in the spring of 2012 while she visited the President of China and Chinese human rights dissident Chen Guangcheng escaped house arrest taking refuge at the U.S. embassy. She maintained major economic discussions with the Chinese Government while she and State Department staff negotiated Guangcheng’s release behind the scenes. Clinton took on Iran on behalf of the Obama administration to win international support to isolate Iran economically. The Iran economic sanctions have severely affected the country politically in the US’ efforts to curb nuclear weapon development in Iran. Similarly, she went before the UN as a major player in the Obama’s administration’s efforts to gain support against the regime of Syrian President Bashar al-Assad. But, even with diplomatic successes there were struggles, the tragic deaths of US embassy staff in Libya including Ambassador Chris Stevens led to Clinton’s receiving extreme blowback for the handling of the September attack on the U.S. diplomatic mission in Libya. As the nation’s top diplomat she took the heat in media interviews and then in the public Congressional hearings in her final weeks as Secretary of State. One thing was clear, even if the agreement on if there was enough done in Benghazi was not, Clinton was grace and cool under the barrage of fire from a predominantly male panel. Also it bares mentioning, as a major diplomat, Hillary Clinton never let go of her undying public support of the rights of women always seamlessly integrating the causes of women and children into her speeches, interviews, and townhalls across the world. And if nothing else, Hillary Clinton worked HARD, displayed not only in her endless mind-boggling jet lagged filled travel but in her work ethic and energy in spite of even injury or illness. After breaking her elbow in a fall on the way to a meeting, Secretary Clinton returned to the State Department in a few days with her arm in a sling, working on speeches and trips to Asia combined with physical therapy. Humanity caught up to her in the form of an awful stomach virus in late 2012 that led to her concussion and blood clot from a fall while ill again. To make it clear, I’ve always been a huge fan of Hillary Clinton from her time as First Lady of the United States. I was a year younger than her daughter Chelsea, when her husband, Bill Clinton, became President of the United States. Back even then in my burgeoning feminist consciousness, I felt a fierce kinship with her. I thought it annoying how often they talked about her hair, clothes and looks and still do as if that was her sum worth. I found it infuriating that the media and legislators chided her for her attempts to play a major policy role in her husband’s administration. As a black immigrant girl, growing up in a small Southern town, I understood what it was like to be dismissed for your ideas and feel out of step with the majority of girls around you in your ambitions. And so when she decided to run for the US Senate, taking her first definitive step out of her husband’s long shadow, I cheered. She worked in the Senate to distinguish herself. And after a successful re-election in 2006, made the steps to run for US President in her own right, a cause on which I made my life at that time. While she was not the first woman to run for President, she was the first woman to win more primaries and delegates than any other female candidate in American history falling short to then Senator Barack Obama. I always wondered why people didn’t see what I saw, an awesome self-declared feminist using her platform in public service and politics to make a genuine difference in the lives of others. So it’s funny to see just how popular as Secretary of State she has now become. In four years, her coolness always derided by many as an inauthentic interest in people, is celebrated in a popular internet meme of Clinton in shades calmly reading her smart phone while chaos erupts around her. Her fun and warm side seen by those who worked and volunteered behind the scenes on her campaigns was finally on display for the world as she danced away the night at international trips after diplomatic work was done for the day. I’m glad more folks love and see the Hillary Clinton that I’ve always seen. While I’m sure her legacy as Secretary of State will be debated amongst the scholars and experts will be debated, and whether she intended to or not, she has set herself to be a serious contender for President again in 2016. Whatever Clinton decides, I do know she’s has not only made it possible for more women to dare to be a leader in politics and public service but challenged us to be the absolute best we can be and that alone is a great lasting legacy. Photo credit: US Consulate Chennai via photopin cc. ← #HealthyLove Tweetchat on 2/11! Welcome to buy iPhone 5s cases at http://www.voguecases5s.com.